Often called the gateway to Europe, the port city of Rotterdam is full of old-world charm. The harbor offers amazing views and a maze of wharves and canals, along with towering spires make for a beautiful sight. Take a stroll and duck into one of the pubs or eateries along the way. Only three pre World War II buildings in the city center have survived and are worth a look - city hall, St. Laurence church and the White House. Explore the Museum Boymans van Beuningen, which houses a unique collection dating from the 14th century, or the Museum Voor Volkenkunde - home to ethnological exhibits. Exquisite architecture can be seen in many areas of Rotterdam, most notably in the Delfshaven quarter of the city - where 18th century houses are on display. For a laugh, check out Kijk-Kubus, an upside-down house. Cobblestone streets wind past colorful houses in this delightful town. In nearby Lysefjord, be sure to visit oft-photographed Pulpit Rock. The Aurlandsfjord would be a magnificent fjord in its own right, with its glassy waters and snow-frosted peaks towering more than 3,000 over the water. What's even more humbling is that the fjord is just an arm of an even longer, more massive one – the Sognefjord. That fjord is the longest in Norway, but your cruise will make the turn south, for Flam. The cliffs crowd ever closer as you near the village and when you get there, it seems there's nowhere to look but up. The town is lovely; the countryside is creased by rivers and waterfalls, and mantled in meadows. Take a ride on the legendary, and steep, Flam Railway. Founded in AD 997 as a Viking seat of power, Trondheim (then Nidaros) holds the Nidaros Cathedral, where all Norwegian coronations take place and the crown jewels are kept. The town of Hammerfest offers a good selection of outdoor activities, including sport fishing, scuba diving, hiking, and boating. Explore the town and marvel at the area's long and proud history (it's been an important fishing and Arctic hunting settlement since the Stone Age). 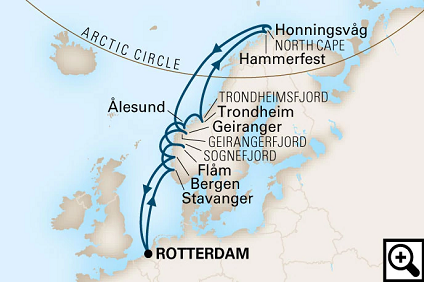 Invigorating and scenic, Honningsvåg, the world's northernmost village, is your gateway to the North Cape. Gateway to fjord country, beautiful Bergen is surrounded by steep, forested mountains and has the lively feel of a university town. *Conditions Apply: Prices are per person, capacity controlled and listed in Australian dollars twin share including port taxes. Prices may fluctuate if surcharges, fees, taxes or currency change, and may be withdrawn at any time. Prices shown here are not shown in real time. While we endeavour to keep our pricing as up-to-date as possible, the advertised prices shown here may differ from the live prices in our booking system. The prices shown are for a cash payment. Credit card fees of up to 2.5% will apply. Prices are per person twin share based on best available cruise fare, inclusive of all discounts unless otherwise stated. All offers are capacity controlled and can be withdrawn or modified at any time without notice and subject to availability at time of booking. Outside and Balcony cabins may have obstructed views and Suite cabins comprises Junior Suites, Mini Suites and any other type of suite that represents the best value for each cruise. ^Onboard credit is non-refundable, non-transferable and cannot be redeemed for cash or used in the Medical centre or Casino. Pinnacle Grill bonus lunch and Caneletto dinner are non-refundable and are to be arranged once onboard and is subject to availability. ~Specialty restaurants may incur a surcharge. All passports, vaccinations and visas are the responsibility of the travelling guest to secure prior to departure from Australia. Some cruise lines reserve the right to impose a fuel levy if the NMEX price reaches a certain level - please check with your consultant at time of booking. Cruise deposit, amendment and cancellation conditions apply. Travel agent service fees not included. Special conditions apply - please ask for full details at time of enquiry. Please note only residents with an Australian address are eligible to book Australian rates in Australian dollars. This cruise package is provided by Seven Oceans Cruising, please ask your travel agent to contact us for more information.